The United States Ambassador to the United Nations Nikki Haley says North Korea is “begging for war” as the U.N. Security Council meets on Monday to discuss North Korea’s latest nuclear test. “Enough is enough. War is never something the United States wants. We don’t want it now. But our country’s patience is not unlimited,” Haley said. South Korea's defense ministry said Monday it had found signs North Korea was preparing to test another ballistic missile. The ministry also announced plans to temporarily send four more launchers for the THAAD missile defense system. Hours before the security council meeting, South Korea’s military fired missiles into the Sea of Japan. 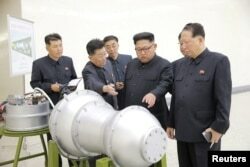 It was an exercise meant to look like an attack on North Korea’s nuclear test site. A U.S. intelligence official said the nuclear device detonated by North Korea on Sunday was 10 times more powerful than its fifth nuclear test a year ago. “We're highly confident this was a test of an advanced nuclear device and what we've seen so far is not inconsistent with North Korea's claims,” the intelligence official said. U.S. Defense Secretary Jim Mattis, repeated the warnings of President Donald Trump on Sunday. He said that North Korea can expect a “massive military response” if it threatens the United States, the U.S. territory of Guam or America's allies. White House officials said the president has a range of retaliatory measures available to the U.S., including nuclear weapons. Experts reacting to Secretary Mattis’s comments are hoping for diplomatic discussions instead of more tough military talk. The president, leaving a church service near the White House earlier Sunday, said only, “We'll see” when a reporter asked if he was planning to order an attack on North Korea. On Twitter, Trump said he is considering stopping all trade with any country doing business with North Korea, raising questions about what this could mean for U.S.-China commercial ties and the two countries' $650 billion in annual trade. Any U.S. call for an economic boycott of countries doing business with North Korea would focus on China because Beijing is North Korea's major ally and its trading partner. U.S. Treasury Secretary Steve Mnuchin said he would prepare a new package of North Korea economic sanctions along these lines for consideration. Dorothy Gundy adapted this story for Learning English based on VOA and AP news reports. Hai Do was the editor. We want to hear from you. Write to us in the Comments Section or on our Facebook page.